Composting in winter is possible. 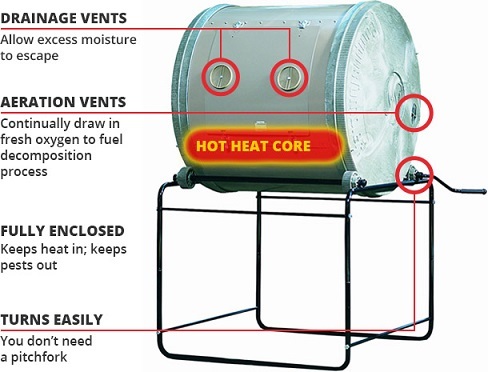 By following a few simple tricks to control temperature and moisture, your compost tumbler will remain active and productive all winter long. Here are answers to some FAQ’s about winter composting for a Spring organic garden! Regardless of where you live, you can compost all winter long! Active composting requires a consistent outside temperature of 40 degrees or more. And when temperatures fall below freezing, the decomposition process comes to a stop but as temperatures warm up in the spring, microbial activity will resume. So keep composting! If you live in an area with mild winters, the process may slow down a bit, but there is no reason for you to stop or change your method. In parts of the country where winters are colder, the best composters for all-year composting are those that are enclosed. They block out freezing elements such as rain and snow, and they store heat. Covers are even available for some composer models. What is the Best Material to Compost during the Winter? The key to winter composting is to add things that will keep your compost warm such as leaves, kitchen scraps and paper products, aka the “brown materials.” You also need to continue feeding green matter to your compost to keep the bacteria alive and working. Are Compost Tumblers Better for Winter Composting? Compost tumblers are the most efficient systems for winter composting, and they also make year-round composting easier. A tumbler can be spun to mix the compost, has aeration, is self-contained and protects compost from hungry wildlife and harsh winter elements. Compost tumblers come with a single drum or two compartments so one batch can be added to while the other matures. Because they are enclosed and elevated from the ground, compost tumblers are the easiest way to help keep compost active through cold winter months. Does Compost Need to Be Turned and Covered in the Winter? While turning a compost pile is important when temperatures are above 40 degrees, in winter, you don’t have to turn your pile as much, if at all. The rain or snow will keep it moist and by not turning you will keep any heat in and the bacteria inside as warm as possible. To preserve any heat during the winter months, keep your compost covered with a generous layer of leaves, tarp, newspaper or cardboard. Surprisingly, snow on the top can also provide a nice insulating cover. Yes! You do not have to brave the cold in order to compost all winter long. If you have a heated shed or garage, you can move your ComposTumbler indoors. You’ll want to be sure to put it in an area where it’s okay to get a little messy from loading/unloading and liquid drainage (compost tea). 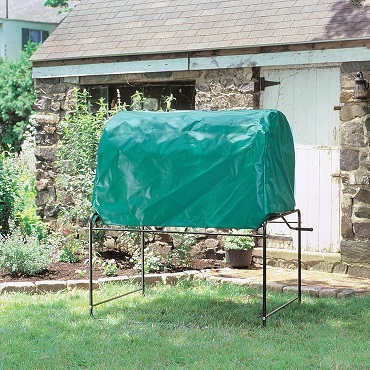 Whatever you decide, be sure to have your compost tumbler ready for spring organic gardening. It will give you a head start on your garden chores!